It sure seems like the glass ceiling (or concrete ceiling, if you’re a woman of color) is holding strong. Women make up almost half of the workforce. You’d think more would have changed as equal representation climbed in the workforce over the last 70 years, with women’s labor force participation climbing from 32.7 percent in 1948 to 56.8 percent in 2016. And yet, only 1 in 5 C-Suite leadership roles are filled by a woman, and only 1 in 30 C-Suite level leaders are women of color. What are women in leadership roles to do besides throw a ladies’ only bonding event? In March, Pat Welch received an email and a package on the same day. 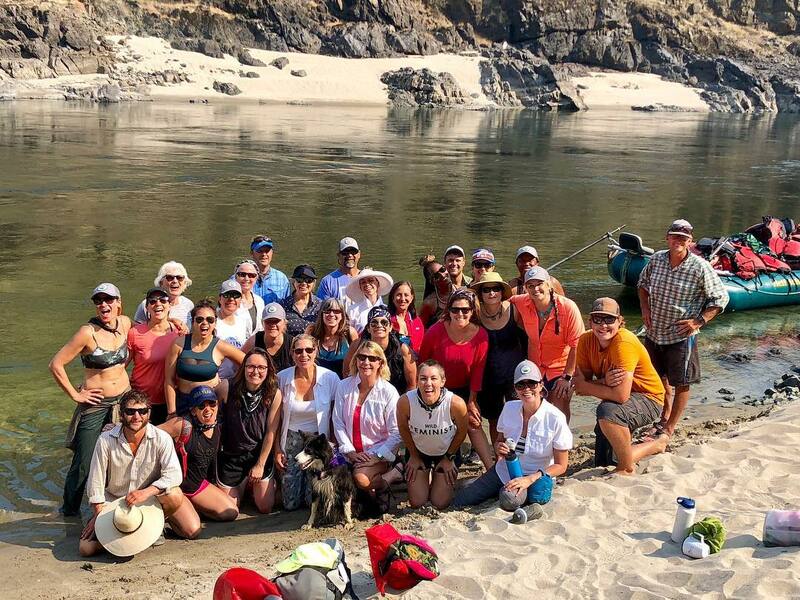 Inside the package was a Dopp kit, a copy of Headstrong by Rachel Swaby, and a personalized invitation from the Freshwater Trust to a four-day glamping-style rafting trip on the Salmon River with 24 other women leaders. The invitation list read a bit like a who’s who of the Portland business community. The members also formed committees, responsible for items such as fromage and chocolates, each with a budget to provide the necessary local and artisanal treats for the trip. Participants were also asked to select two bottles of their favorite wines to share during the week. Lastly, the group discussed ground rules for the trip. Although there were quite a few offers, they decided, after some discussion, to leave behind reporters and photographers, recognizing the importance of bonding and creating a “cone of silence” that would allow them to be truly open and authentic. The women took off in a few private planes at 4:30 AM on August 6, and were on the Salmon River before midday. The next few days were a blur of Class II-IV rapids, freshly grilled vegetables and meats (paired with wine, of course), warm sandy beaches, and real and deep conversations about what it means to be a woman, mentoring, business, raising capital, and life experiences. There was even an impromptu karaoke night. 1. Always take each other’s calls. “There was a lot of conversation during the trip about mentorship. It didn’t matter if you were older or younger – it’s important to always be there for each other,” Pat explains. Up to 48 percent of female founders reported a lack of suitable mentors and business advisors that limited their professional growth, probably because so many of these traditional sources of mentorship are male. After this trip, there are 24 more women with mentorship and support. 2. Raise awareness about the struggles women entrepreneurs face. Only 30 percent of businesses are owned by women. However, these women-owned firms have grown at 1.5x the rate of other businesses. That’s only one of the barriers women leaders and founders face. Raising awareness and challenging the status quo will hopefully help dismantle barriers to success for women. 3. Try to connect without distractions. Because we all listen a little better when we don’t have our phones out.